Among the strange attractions are two unusual pubs, a pinball museum, a moving monument and the biggest hourglass in the world. Hungary’s capital, Budapest is a stunningly beautiful city, lying across the River Danube. In two parts, the Chain Bridge from the 19th century connects the Buda district to the other side, which is Pest. In Buda’s old town there is a funicular which runs up Castle Hill, while the Budapest History Museum has exhibits dating from the Roman times. There are more attractions in Trinity Square, with its Fishermen’s Bastion and the Matthias Church which dates back to the 13th century. While all this is fascinating, there is also a more unusual and hidden side to the city, which we explore below. Among the attractions are the For Sale and Red Ruin pubs, a row of iron shows on the banks of the Danube, the largest hourglass in the world and a pinball museum. The For Sale Pub is not actually up for sale. This unusual drinking establishment in a posh shopping centre allows visitors to leave personal ads wherever they like. The ceiling and walls are covered with notes left by the clientele. The floor is a little unusual too, as it is covered in straw and the pub invites its patrons to drop peanut shells all over the floor. Judging by the video, they play some pretty good music there too. This haunting and sad attraction was created to remember the almost 20,000 Jews who were brutally shot and killed by the Szalasi on the banks of the River Danube. They were forced to remove their shoes, as those were a valuable commodity back then, before they were shot and fell into the icy water. 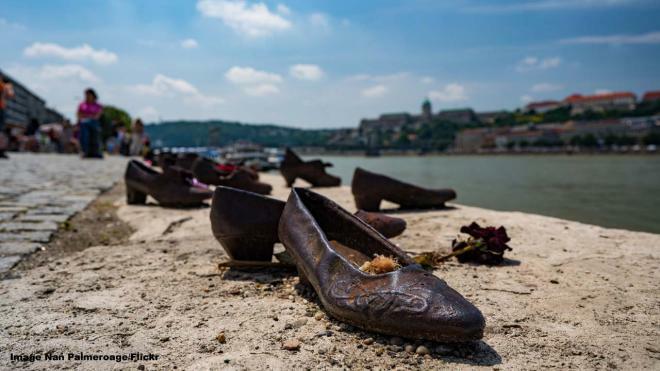 The simple and moving monument was created in iron by sculptor Gyula Pauer and film director Can Togay and consists of 60 pairs of shoes.